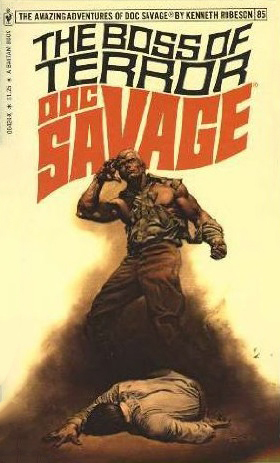 Doc Savage is, in many ways, a pulp forerunner of the comics super-heroes. But one of the ways Lester Dent’s tales don’t resemble the comics is the lack of continuity. 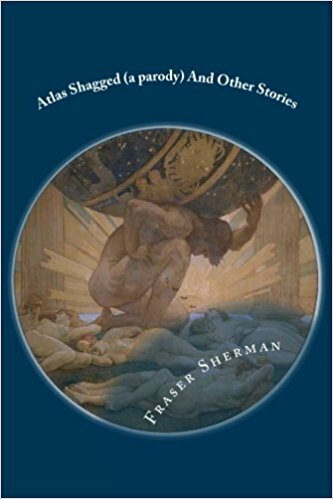 THE BOSS OF TERROR (cover by Boris Vallejo, all rights to current holder) opens in media res: Doc, Monk and Ham crash an ambulance into a limousine, part of a plan to get inside the mansion of millionaire “Radiator” Smith (wealthy from manufacturing automobile radiators and the like). Smith’s scared, wants to talk to Doc, doesn’t want the meeting publicized …but when Doc, posing as Smith’s chauffeur, gets inside the mansion, Smith insists he never called, doesn’t want to talk, please go away. And then Smith’s son gets done in with lightning. That struck him inside a closed room. And then more men, also named Smith, die the same way. By the end of this fast-moving adventure (not great, but fun), it turns out the villain’s gimmick is exactly the same as the McGuffin in World’s Fair Goblin — a suitcase-sized battery that can store enough energy to power a skyscraper. Or electrocute someone; it turns out the invention in this book can only generate static electricity, which doesn’t work for power generation, but does fine as a murder/extortion weapon. 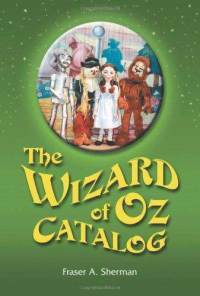 At no point does anyone refer to the previous adventure, which happened only a year earlier. I’m guessing Dent realized he hadn’t done much with the device in the previous story, so he used it as a murder weapon this go-round. But reading in original publication order (the paperbacks were closer to four years apart) it does seem odd nobody mentioned the resemblance. A minor surprise is that the woman in the story, Annie, is nothing but an adventurer looking to make money off the gadget. She seemed so purposeful, I assumed she must be a female spy like Annabel in The Angry Ghost. THE AWFUL EGG (cover by Bob Larkin, all rights to current holder) is one where continuity references would definitely have helped. It opens with Dr. Samuel Harmony (a phony doctor, I should note), abruptly shutting up his business and firing his receptionist, Nancy. When she talks to her boyfriend about it, someone shoots at her — which convinces the couple to contact Doc Savage. Harmony, meanwhile, heads out west into the Badlands of Colorado. It turns out he’s an amateur paleontologist (though Dent refers to paleontology as archeology throughout the book) so he decides to pass his time on the run hunting for fossils. Johnny poses as a local guide, giving him his best role in ages. We learn he started using big words as a rookie archeologist/geologist to impress people, but enjoyed it enough to keep it up even after becoming established in his field. During the expedition, they find an ice cave where they unearth a dinosaur egg. Which gives Harmony an idea … but not a great one. After splitting from Johnny, Harmony kills and mutilates an animal, then a human adversary, to make it look like something actually hatched out of the egg. Then he uses a mock-up dinosaur to attack his rivals — it turns he and the other bad guys are in a three-way contest for control of a gold hoard. 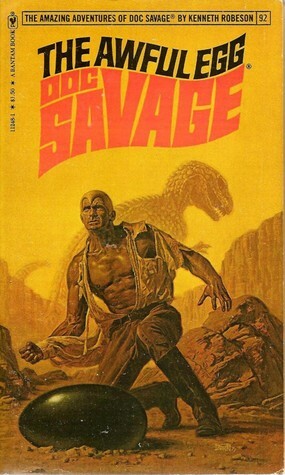 The thing about Doc Savage stories is, it’s entirely possible to have a dinosaur show up, unlike, say, The Shadow. Doc battled dinosaurs just a few months ago, in The Other World. So why not reference the story to make the fake monster more plausible? You’d think Doc’s men would bring it up. I’m not sure it would help, as the scheme is strained (at times it feels like Dent had just read up on dinosaurs and wanted to show off his know-how) and one of the villains pretty obvious. A minor inconsistency is that Ham now smokes cigars, which is treated as something he’s been doing since forever (whereas Monk, who’s sometimes shown as a smoker, apparently isn’t). A minor surprise is that Nancy turns out to be a selfish gold-digger, so much so even the libidinous Monk isn’t interested. Usually the female guest-stars were good girls.